If you are looking for the same nutrients as whole milk, but want to cut calories and fat, skim milk is a great choice! Clover Farms Skim/Slim Milk has virtually no fat or cholesterol and very few calories, but provides all the same important vitamins and minerals found in whole milk. Did You Know? Some people believe that water is added to whole milk to reduce the fat content for skim milk, but this is just a myth! Fat is lighter than the other ingredients in milk. When left undisturbed, the cream —where most of the fat is — rises to the top, leaving behind milk with much less fat. In modern dairy technology, non-homogenized whole milk is placed into a machine called a separator, which separates the milk by centrifugal force into two parts – fat/cream and skim milk. 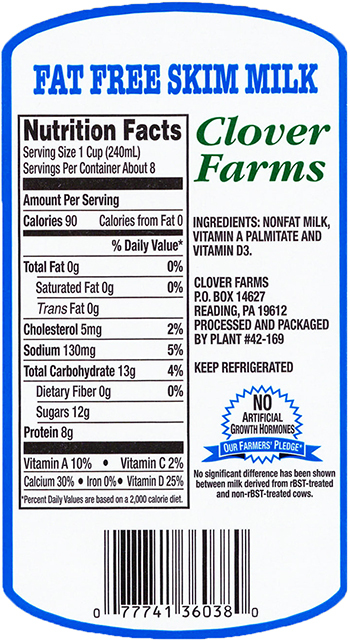 Because vitamins are fat soluble and lost when the fat is removed during the skimming process, we fortify our skim milk with vitamin A and vitamin D.
About Us: Clover Farms was established in 1937 in the rich, rolling hills of Pennsylvania Dutch dairy country. Our milk gets its unique great taste from our dedication to quality monitoring, careful processing, and attention to detail in packaging. For more than 80 years, we have maintained a tradition of quality, freshness and flavor in each refreshment bearing our name. Our 170 farm families work hard to provide the best milk available, enabling us to supply you with premium-quality dairy products. Try some today! Clover Farms Skim/Slim Milk has none of the fat and all the great taste and nutrients. Start and end your day guilt-free! A single cow will produce nearly 7 gallons each day, that’s more than 2,500 gallons per year. That’s why it’s important for everyone on the farm to pay close attention to everything in the process from selecting the right feed to filling the Clover Farms truck.